My women’s choir, Cantigas, sang once at the Edna McMahan Women’s Prison in Clinton, New Jersey. 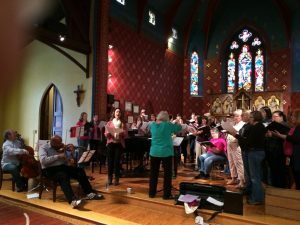 The choir were conservative, liberal, and apolitical, Catholic, Jewish, Orthodox, and atheist, old, young, gay and straight, yet they all felt they were contributing something meaningful to the inmates’ lives. Thirty choir members took the day off to participate, and the ones who couldn’t come seemed regretful. We had to fill out forms weeks before the event, and lists of choir members were provided. Before getting on the bus to drive from the intake area to the maximum security section of the prison, we had to divest ourselves of everything except our driver’s license and a car key. We even took off our wedding rings. Purses were locked in the trunks of our cars. The only comparison I could conjure up was my years at summer camp, where we wore uniforms, were herded around by counselors, had a rigid schedule, and had to obey the rules. The danger and despair of prison life was mostly hidden from us, so I was left stupidly comparing uniforms. We stood in rows at one end of a large gym with folding chairs for the inmates. Cantigas had members from all over the world; New Zealand, Poland, Finland, Argentina, Spain, France, Taiwan, and so on. We were rich and poor. We were as diverse as a choir could get, yet as we walked in I was conscious that to the inmates we looked like a gaggle of white women, our diversity hidden beneath our skin. After singing a few songs, the husband of our accompanist played a few classical pieces on the violin. The warden told us to sit wherever we wanted while he played and I wanted to sit among the inmates. There was one young black girl sitting apart and I zeroed in on her. She had been watching us sing out of the corner of her eye, suspicious, protective, hostile. When I sat next to her she hunched away from me, but I said, “Hi!” and she turned to me with a bright, and unexpected, smile. Partway through the violin pieces, she made a chopping motion on three places of her arm, and, while looking straight ahead, made signs with her fingers which looked to me like the sign language of the deaf, though she wasn’t deaf. She also emitted a low whistle several times during the performance. I couldn’t tell who was receiving her messages. I felt a twinge of fear. Filing out of the gym, one inmate brushed close to us as she headed to the checkout cage. The guard said something to her and she shouted, “I’m a murderer, not a thief. You won’t find my hands in nobody’s pockets!” She was laughing, proud not to be a thief. In the minimum security building we had a warm reception. Our director asked where people were from, and when she said, “Anybody from Camden?” three woman whooped and shouted, “Yeah! !” Camden was, at that time anyway, a sinkhole of crime, addiction, lawlessness, and poverty. Yet the three women were wreathed in smiles at the mention of their home town. There were recreational facilities, classrooms, space, and apparent order. There were burly male guards and slight female guards, a warmly smiling matron, gates and locks and cages everywhere, and Kevlar vests. Lurking in its rooms and hallways were danger and despair which revealed themselves only slightly. The inmates sang with us when our director invited them to sing. When we sang “Sometimes I Feel Like a Motherless Child” some women wept—they were far from their own children, far from home, also far from naked danger and drugs (one woman was carrying a book, Helping You In Your Recovery from Addiction). There was also the possibility that the newspaper reports about prison corruption were true. We couldn’t judge, but all of us felt good bringing some music into the lives of people who didn’t have much of it.